Principal Cast : Lily James, Cate Blanchett, Richard Madden, Helena Bonham Carter, Sophie McShera, Holliday Grainger, Nonso Anozie, Derek Jacobi, Stellan Skarsgard, Haley Atwell, Ben Chaplin, Eloise Webb. Synopsis: The age old story is reinvigorated once more. What we think : We all know the story, and Cinderella’s 2015 revamp by Disney ticks all the boxes it needs to to bring its classic moments “to life”. Much like Maleficent before it, Disney’s live-action Cinderella captures the charm, the wit, the fantasy and the beauty of this age-old story about a young girl who falls for the handsome prince, before footwear issues come between them. I wasn’t prepared to like this movie – I’m a stickler for the classics, and Disney’s animated gem remains the high-water mark for me – but those goddam mice… yeah, Disney’s magnificent live-action remake of the classic fairy tale works on just about every conceivable level, what with Kenneth Branagh’s saturated visual choices and eloquent narrative language hitting the mark perfectly. Cinderella isn’t a story I’m particularly kind to these days; numerous film and television versions of the tale have diluted its overall punch, but even though it touches the necessary plot points, it retains a charming, near-childlike elemental potency, much like previous modern classics such as The Neverending Story. Yeah, I compared it to The Neverending Story. Those mice, you see. Lily James (Wrath Of The Titans) plays Cinderella, the young girl left orphaned with her new, cruel stepmother (Cate Blanchett) and two horrid stepsisters (Sophie McShera and Holliday Grainger), to work her life away as a servant in her own home. One day, she meets the Prince (Game Of Thrones’ Richard Madden), who falls desperately in love with her; after being invited to a grand ball at the palace, Cinderella is given a sparkling new dress by her Fairy Godmother (Helena Bonham Carter), but…. she must be home before midnight before she turns into a pumkin there I said it. Look, if you’ve got kids – daughters, particularly- Cinderella will absolutely delight them. Hell, if you’re a grown adult, Cinderella is still delightful. Given the propensity of Hollywood to reinvent its own properties seemingly every other year, Cinderella’s place within the Disney canon of live-action films (following Maleficent’s blazing commercial success) is assured as yet another hit even in spite of being such a well-known story. 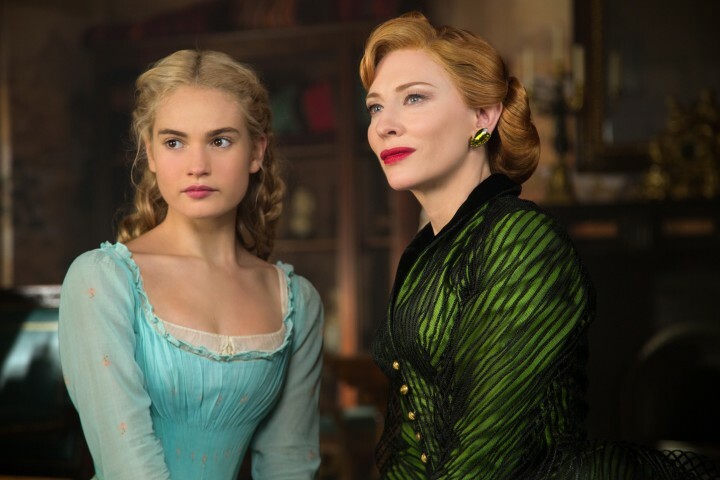 Lily James’s lovely performance as the title character – minus the singing of the cartoon version – is as effective as that of Drew Barrymore’s “realistic” version in Ever After, while Cate Blanchett’s sniping, angry Stepmother is both deliciously evil and somewhat humanized. Then there’s Helena Bonham Carter’s hilarious Fairy Godmother, who bumbles her way through the central “you’re going to the ball, dear” sequence with a great British flippancy. Bonham Carter sells the role well, and she had to since it brings actual magic into the film for the first time, meaning if she didn’t pull it off, the transition from “this could happen” to “no f@cking way!” wouldn’t work. 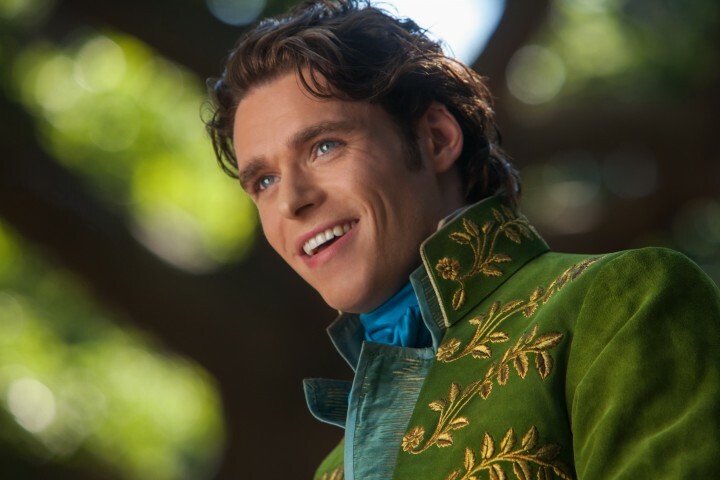 Richard Madden makes an on-point Handsome Prince, a far cry from the dullard one in Maleficent, and his piercing blue eyes and square jaw will no doubt make almost anyone with a the right chromosomes go weak at the knees. Small roles to Derek Jacobi (as the King), Haley Atwell and Ben Chaplin as Cinderella’s short-lived parents, and Stellan Skarsgard as one of the King’s advisers, fill out the supporting roster and provide Branagh’s film with enough eye-candy and thespian heft to keep it from becoming to farcical. Indeed, Cinderella’s live-action route had the potential to majorly trip up with so much whimsy and fantasy. But Branagh’s deft directorial touches, such as the vaguely anthropomorphic mice (yeah, I loved them!) and rich touches of wiley humor sprinkled through the framework. The nods to Disney’s animated version are also deftly handled – they’re there, but not overbearing enough to make people go “oh, they copied that from the other one”. It’s subtle, yet balanced. 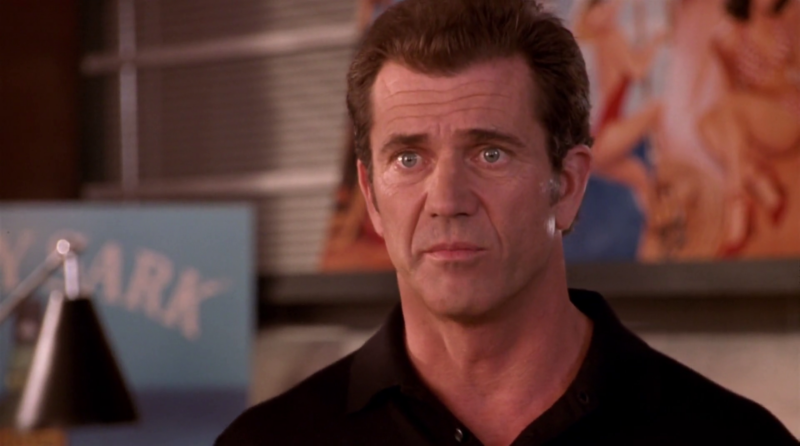 The cheeky smile you have whilst watching this film is infectious – c’mon, as if you really buy into the sexist dogma of a woman chasing a man she’s only met once because she’s fallen in love with him – due largely to the winning performances of the cast. Oh, and the stunning production values. 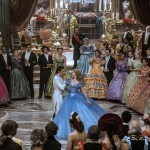 Cinderella looks like a billion dollars, particularly the royal palace sequences, as Lily James is almost swallowed up by the cavernous settings and the resplendent costuming (another Oscar-caliber element of the movie). Branagh’s camera sweeps through this movie with strength and a command of the story like no other. I guess with his history of Shakespearean cinema (his four hour Hamlet remains the definitive version, if you ask me) and modern blockbusters (Thor), the man has refined his style to the point where he’s become exceptionally good at knowing how to tell a specific story the way it needs to told. The cinematography is just superb (another Oscar contender, I’d say), with regular Branagh accomplice, DP Haris Zambarloukos giving Cinderella a rich, textured color palette (the look of the film is like visual opera, it’s so spectacular). It’s fair to say Cinderella isn’t exactly surprising, inasmuch as you kinda know where the story is going to go, but Branagh’s superb creative choices and energetic, glossy direction make it feel like you’re watching this concept for the first time, or at least only the second or third time. Bright and breezy, easily consumed and on-the-nose romantic, Cinderella will please audiences of just about any age or demographic. And those mice. Nice job, Ken. Lovely review! I wasn't expecting to like this as much as I did. Beautiful sets, costumes and visuals. I had low expectations too, Jack! But this film utterly surprised me at just how good it was!